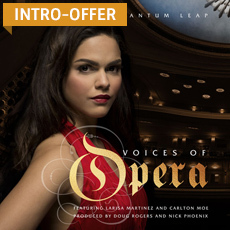 Get Voices of Opera, the opera vocal instrument with the voices of soprano Larisa Martinez & tenor Carlton Moe, for the unbeatable introductory price of € 199 (later € 299). Offer extended till April 25th 2019 at midnight! EastWest is proudly presents Voices of Opera, a instrument featuring the sensational vocals of soprano Larisa Martinez (Andrea Bocelli) and tenor Carlton Moe (Phantom of the Opera). Voices of Opera is perfect for any composer looking to add a pristine operatic sound, and fits in perfectly with EastWest's recent slate of award-winning vocal products Hollywood Choirs, Voices Of The Empire, and Voices of Soul.